I got Martha Stewart’s Cupcakes: 175 Inspired Ideas for Everyone’s Favorite Treat and she’s got some amazing Carmel cupcakes, that I’ve been wanting to try for awhile, but then I came across this recipe over at Sprinkles Bakes, and I knew I HAD to try these, yes I mean HAD, I was being forced by both the little angle and devil on my shoulders. ~Preheat oven to 325. Gets papers in your muffin tins. ~Combine flour, baking powder and salt; set aside. ~Cream butter and brown sugar on medium-high speed until fluffy. ~Add eggs, one at a time, beating until each is incorporated. ~Add vanilla. ~Mix and scrape down sides of bowl as needed. ~Add flour mixture in three batches, alternating with two additions of buttermilk, and beating until combined after each. ~Divide batter evenly among cups, filling each about halfway full. ~Bake for about 25 minutes. ~Transfer pans to wire racks to cool for at least 10 minutes; take cupcakes out of pan and let cool completely. ~Melt the sugar over medium high heat in a large pot. ~Whisk the sugar as it melts and cook until it becomes a deep amber color. ~Add the butter and stir it in until melted. ~Pour in the heavy cream and whisk until you get a smooth sauce. ~Remove from heat and let cool slightly. 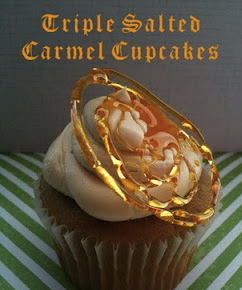 ~Cut a small round piece out of the tops of each cooled cupcake and pour in 1 tsp of caramel. ~Replace the cake piece and set cupcakes aside. ~In a saucepan, stir together granulated sugar and water. ~Bring to a boil over medium high heat. ~Cook without stirring until mixture turns a deep amber color. ~Remove from heat and slowly add in cream and vanilla, stirring until very smooth. ~Let caramel cool for about 20 minutes, until it is just barely warm and still pourable. Don’t use if still warm, be patient my dear, be patient. ~In a mixer fitted with paddle attachment, beat butter and salt together until fluffy. ~Reduce speed to low and add powdered sugar. Mix until thoroughly combined. ~Scrape down the side of the bowl and add the caramel. ~Beat on medium high speed until light and airy, and completely mixed (about 2 minutes). ~Mixture should be ready to use without refrigeration. ~If your caramel was too hot when added, it will cause your icing to be runny. If this happens refrigerate for 15-20 minutes. ~Lay out a large piece of parchment, or Silpat on your work surface and spray with cooking oil (such as canola, if using parchment). ~Fill your sink partially full of cold water. ~Put sugar, salt and cold water in a heavy pan; stir over low heat until sugar dissolves. ~Increase heat and bring syrup to a boil. ~Lower heat slightly and swirl the pan once or twice as the syrup caramelizes so it will color evenly; do not stir. ~When the caramel is deep amber, plunge the base of the pan into ice water for about 2 seconds to stop further cooking. ~Working quickly, dip a spoon in the caramel and let it fall onto the parchment paper in a drizzle. ~Move the spoon in a circular motion as the syrup falls from the spoon. ~When caramel has hardened (it will still be sticky) sprinkle on the large-crystal sugar. ~Remove from paper and place atop those yummy cupcakes. Categories: All-Amerian, Baking, Caramel, Cupcakes, Sweets | Tags: baking, carmel, cupcakes, sweets | Permalink.